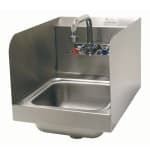 Durable for high-volume use, the Advance Tabco 7-PS-56-2X wall-mount commercial sink is made of stainless steel. The unit is all TIG welded for strength and blended to match adjacent surfaces. It has a 9-inch-by-9-inch-by-5-inch bowl, and large corners ensure employees can reach into crevices when cleaning. A no-drip edge and side splashes prevent soap and water from contaminating work surfaces. In our commercial sinks resource guide, you can read more about these units.